In the 1920’s a handful of Latin American painters rejected the ideological program of Orozco, Rivera, and Siqueiros, the great Mexican Muralists. The most prominent artists of this “new generation” were Rufino Tamayo and Carlos Merida, both of whom preferred abstraction to realism and easel paintings to murals. Tamayo has gained recognition as a major figure in 20th century art. Carlos Merida deserves further recognition for his achievements. He pioneered abstraction in Latin America. Merida, through his understanding of modern art and the plastic traditions of pre-Hispanic cultures, has synthesized a unique geometric language. As early as 1920, Merida was creating art with distinctly American roots. He was the first artist to expose the Mexican public to contemporary art inspired by Indian culture. In the words of critic Cardoza Y Aragon, “the whole problem of artistic culture in America was being debated in these paintings.” These early works, often reminiscent of Matisse, explore in broad flat areas of color the decorative beauty of the Guatemalan Indians. Diego Rivera was so impressed with Merida’s paintings that he asked him to help design and execute the first murals at the National Preparatory School in Mexico City. Merida subsequently painted murals for the Ministry of Education. By the mid 1920’s, however, he was drawn increasingly toward the more intimate charm of easel painting. His forms became less geometrical, fantasy has full play, and his composition is fluid. A good example is Profile (watercolor, 1928,) in which almost the entire pictorial space is occupied by a distinctly Mayan head in profile, which in turn serves as a background for various smaller seated figures grouped rhythmically throughout the composition. These musical analogies are not so far fetched when one remembers that Merida had at first intended to be a musician, until a hearing impairment put an end to that hope. The evolution of Merida’s work from the 30’s to the mid 40’s reveals a progressive assimilation of Modern European painting, particularly surrealism. In addition to Klee and Miro there are glimpses of Picasso and Kandinsky. It is testimony to the strength of Merida’s art that, despite these influences, his paintings remain distinctly American. In the 50’s and 60’s Merida’s work became architectural. He became interested “in integrated art”—that is, art as an integral part of a larger architectural whole. Through geometric reduction he transforms the Indian figures in his paintings. They become as monumental as their surrounding architecture while losing nothing of their delicate line and textures. In the 70’s, Merida’s work as an abstractionist reached a zenith. 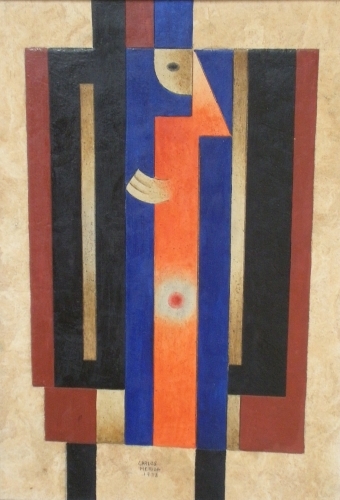 His painting retains vibrancy of color (red, blue, brown, turquoise and orange) but the forms become even more rectilinear. These paintings, with their striking compositional rhythms, rival the best of Mondrian and Klee for sheer beauty of formal structure.